Courtesy of Latin American Network Information Center (LANIC). Photos of trail Angus McIntyre. This lesson will show how the Inca communicated across the vast stretches of their mountain realm, the largest empire of the pre-industrial world. It will explain how couriers carried messages along mountain-ridge roads, up and down stone steps, and over chasm-spanning footbridges. Couriers could pass a message from Quito to Cuzco in 10 days, about the same time as it takes today's modern postal service to deliver a letter between those two cities. This lesson plan consists of four learning activities that build upon one another and should, therefore, be used sequentially. 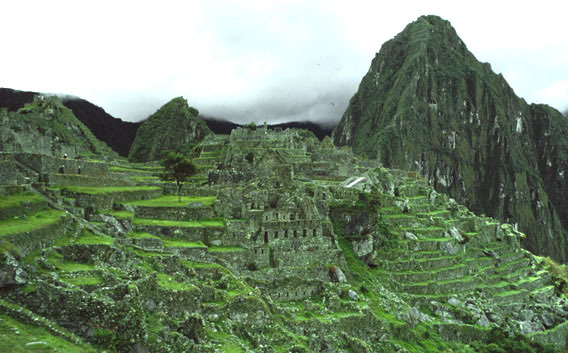 The first two activities provide background and context on the Inca Empire. The second two activities consider the Inca courier system. The lesson can be extended by examining the Inca use of quipus, the knotted ropes employed for record-keeping. Much of what we know about the Inca and their empire comes from the Spanish. However, in order to keep the focus on the Inca, the lesson makes no reference to the European conquest of South America. Review the suggested activities, then download and duplicate any online materials you will need. If desired, you can bookmark specific web pages so that students can access relevant online materials directly; print out required pages and duplicate copies as necessary for student viewing. For Activity 2, you may wish to have at hand a picture book of South America or Peru that helps to show the ruggedness of the Andes terrain. Activity 1. Who Were the Inca? As far as the Inca were concerned, theirs was the greatest of all the world's civilizations. They may have been right. Their empire was the largest of the pre-industrial world; their golden capital, Cuzco, the richest city in the Americas. Beginning in the 1300s, the Inca moved down from their Andean homeland to conquer the neighboring lands and peoples along the Pacific coast of South America. By the time the Spanish arrived in the early 1500s, the Inca Empire was at the height of its power. It stretched some 2,500 miles—the approximate distance from Washington, DC, to Los Angeles, California—and incorporated more than 12 million people speaking 20 different languages. For background on the empire, consult the EDSITEment-reviewed site Conquistadors; read the pages on "Growth of the Inca Empire." Begin by asking what the students know about the Inca and the Inca Empire. They may associate the Inca with a number of things, such as the Andes, gold, mummies, South America, terraced farming, llamas, or Machu Picchu. Explain that there were several significant things that the Inca did not have: the wheel, the horse, or the written word, all of which will have significance for this lesson. Before proceeding to the next activity, ask the students to write three to four sentences answering the question, "Who were the Inca?" Activity 2. Where Were the Inca? Have the students locate the Inca Empire on a map. Show the empire's geographical context by going to the map site on the EDSITEment-reviewed website National Geographic's Xpeditions. On the world map, click on South America. Explain that the Inca Empire stretched along the western part of the continent, from what is now Colombia to northern Chile. Examine the empire in more detail by clicking on the map in the right-hand margin of this page from the EDSITEment-reviewed resource Conquistadors. Explain to the students that one geographical feature dominates this stretch of land: the Andes mountains. The Andes run for 4,500 miles along the west coast of South America, making them the longest mountain range in the world. They rise 20,000 feet into the air—more than half the height at which a jumbo jet cruises. There's little oxygen up that high, and it's often bitterly cold. 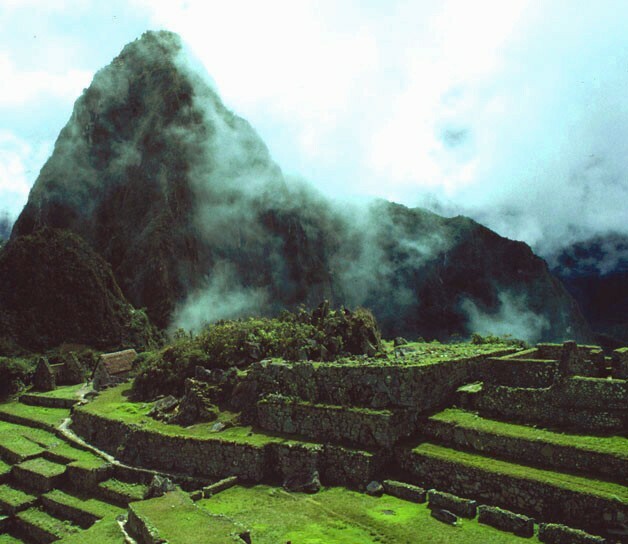 Yet it was there that the Inca built their empire in the clouds—the largest in the pre-industrial world. Use a picture book of the Andes if you have one. Have the students write one to two sentences answering the question, "Where were the Inca?" How do you think messages were passed across this great mountain empire—in a time before automobiles and planes and telephones and email? The Inca didn't even have horses or the wheel or a written language. Yes, they had llamas, but these animals didn't like to be ridden and were only used to carry supplies. All traveling was done on foot. How did the Inca pass messages? They used couriers. Explain that the Inca built a 10,000-mile network of trails, some as wide as 24 feet, to knit together the parts of their empire. Show the students a section of one of the trails at the Virtual Inca Trail, and at the Conquistadors site (click on the road icon in the right-hand margin). How do you think the couriers passed on their messages? Remember, they had no written language. They had to pass on memorized messages. So they not only had to have good legs, they had to have good memories, too. Have the students write two to three sentences answering the question, "How did the Inca get their messages across the mountains?" Set up a game of telephone for the class to show how messages that are passed on by word of mouth can go wrong. Have them communicate a message of four sentences. Then show the students how mnemonics can help. N ot much going on here. C an you send me a message by courier? A ll I need to know is that you're OK.
Have the students memorize the message, then try to deliver it again. To pass on their messages, Inca couriers also used quipus. Quipu means knot in Quechua, the native language of the Andes. The quipu was a useful record-keeping tool for the Inca government. For background, visit Conquistadors; click on the right-hand icon "Quipus." Quipus were special knotted strings that kept track of numbers. Different-colored quipus stood for different things. Yellow, for example, stood for gold; red stood for warriors. Different knotted strings were tied together to convey a message. Have the students make their own quipu to show the year they were born. Explain the use of quipus, colored and knotted ropes carried by couriers that tallied numbers of warriors, amounts of gold, quantities of corn, etc. How did the Inca communicate over large distances in an empire without the wheel, the horse, or the written word?